I used to buy this spongy cake from Taman Segar pasar malam every Friday. I think this guy Ma Lai Koh is the best. I like to eat it by spreading some kaya on top of it and with a hot cup of Milo. I used regular sugar for this cake but the next time I make this again I am going to try it with palm or brown sugar. I am sure it will taste so much better like the one BBO did. 1) Whisk (a) until light and creamy. 2) Fold in (B) and then (C) until well combined. 3) Pour batter into a well greased baking pan and steam on high heat for 30 min or until skewer comes out clean when tested. 4) Cool complete before cutting. Gert.. selalu you masak saper makan ya? mesti best kan ada tukang masak. Bole i tumpang gak sekaki? oh great another food blog! yipppeeeee!!! Gert, i dah pernah buat this ma lai koh, macam apam or kek kukus gitu kan? oh ya, i tried dat shrimp pasta already, my dotter said, yummy! hhee...tq dear. wahh, dah start baking eh! for d christmas? u must bz now..have a nice day Gert! 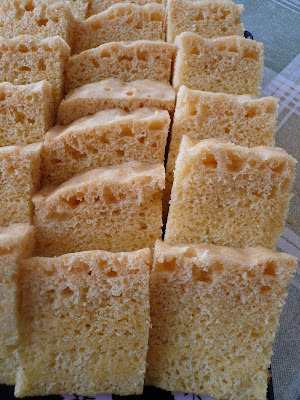 Rita, I am not too sure which type of crispy biscuit you are refering to :) Yeah, this steam cake is easy to make. Laundyamah, thanks for dropping by. Jun, this cake is like apam :) Yeah, the cookies are for Christmas. Gert, I ate this koh with kopi-o, mo tak thengleh, yum yum. BBO, next I am going to try out your recipe. Choy, glad you likes it. Beachlover, how come your hubby refused to take the some of your baking to work. At least he can share it with his office mates. At least you can share it with your neighbour. I was wondering which brand custard powder do you use? It is sweetened? I can't find it. I am in CA. Can I use Jello pudding mix to substitute? Thank you! I really want to try your mai la ko! Jenn, I used 'bird' custard powder. You can get custard powder from the Indian store in CA. 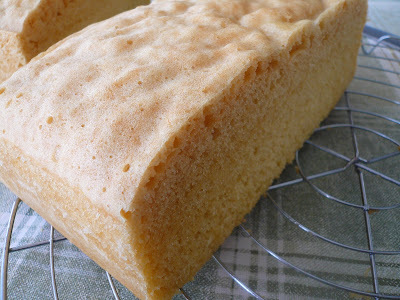 If not just substitute it with corn flour but your cake won't have the nice yellow color. Thank you for sharing this recioe. I love the flavor of this cake, especially when I use palm sugar instead of regular sugar. My cake was light and fluffy on the top but turned out dense at the bottom. What can I do to fix this? When I sifted in the flour mixture, the flour formed lumps in the batter. What is the best way to get rid of them? I ended up sifting the batter to get rid of the lumps. Thank you! Tintin, glad that you like the cake. Kathy, did you shift all the ingredients (C) before folding it into the egg mixture? No wonder your cake is dense. When you sieve the batter you get rid of all the air that you incorporated in when you beat the eggs. Try folding the flour into the egg mixture in 3 batches and don't put it in all at once. This might help to get rid of the lumps. Thanks for the recipe. Just wondering, if the measuring spoons you use are the same as the ones in Australia, does your (1 tablespoon = 20ml) and (1 teaspoon = 5ml)? Thanks. Anon, the measurement are the same. Eileen, did you beat your egg and sugar by hand or mixer? I used my KitchenAid and beat if for 7-8 min on high speed. You have to beat it until ribbon stage. Thanks for your quick response. Yes, I beat using kitchenaid mixer and I think I beat less than 5miins. I use speed no. 2, is that correct? Thank you! Eileen. Eileen, you start slow and then crank it up to at least speed 6 or 7. I tried this recipe today, it turned out very well. Thanks for sharing! Thank you for this ma lai ko recipe! It was absolutely delicious, but slightly dry. Would you suggest I decrease the steaming time, or let the cake cool in the pan instead of turning it out onto a rack (I turned it out after 10 minutes). What are your thoughts? Thanks in advance!!! I love to view yr blog, many delicious yummy food. Would like to know if i can dissolve brown sugar with little water first then I pour in the syrup into egg to beat. Is it possible ? Hi Marisa, this is a steam cake so it should not be dry. Did you measure the liquid ingredients correctly? Hi Miss Cake, I am not sure what brown sugar you are using. If it is just regular light or dark brown sugar you can just beat it together with eggs without making it into syrup. Hi...if I want to turn it into pandan flavour what do I omit. How much pandan juice and essence do I add in?